Addut-Lamanu is a Dunmer healer who sells ingredients and potions from her yurt in the Erabenimsun Camp in the Molag Amur region. Addut-Lamanu wears a common shirt with matching pants. Aside from her natural resistance to fire and the sanctuary provided by her ancestors, she knows the following spells: Burden of Sin, Crushing Burden, Cruel Weary, Dire Weary, Great Feather, Second Barrier, Strong Reflect, Strong Spelldrinker, Wild Spelldrinker, Blood Gift, Powerwell, Vivec's Mercy, Poet's Whim and Slowfall. 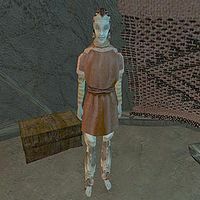 As a member of the Erabenimsun Tribe, killing her will anger the tribe and prevent you from completing the Erabenimsun Nerevarine quest, a required part of the Main Quest. This page was last modified on 23 November 2018, at 06:03.